A month or so ago Penningtons contacted me to see if I’d like to try an item from their 2011 Holiday Look Book. 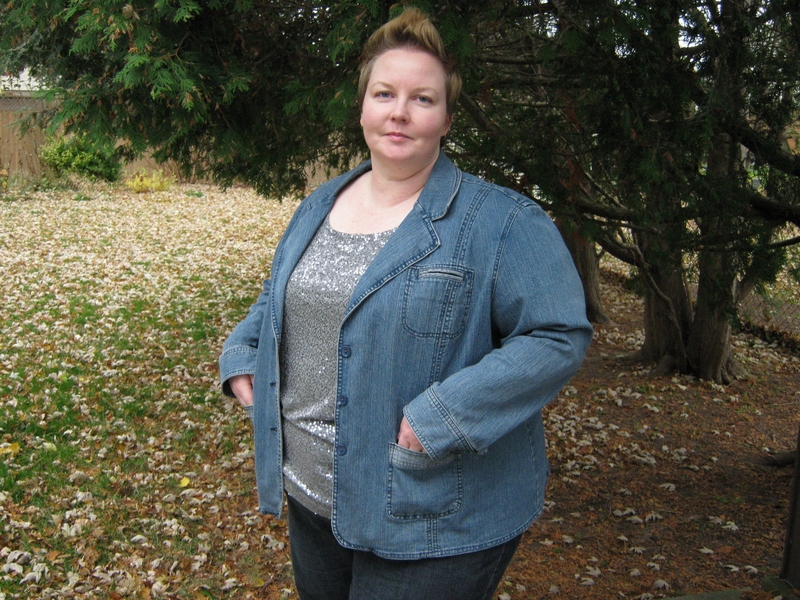 I was really excited for the opportunity to try out their clothing because the Canada-based company had recently flown onto my radar when they invited some bloggers I read to an event. 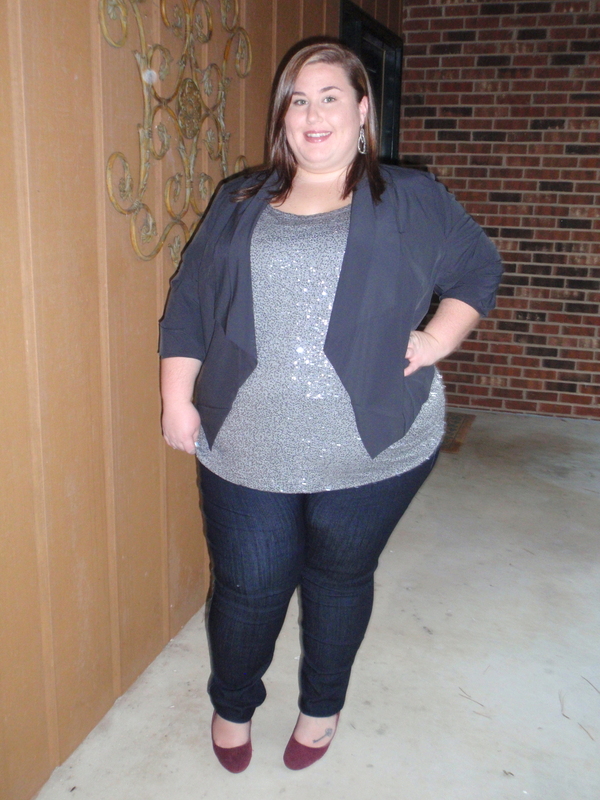 They sent me their Short Sleeve All-Over Sequin Tee in Silver, and I immediately fell in love. I decided to put it together in an outfit that I was going to wear to meet my sister for dinner, but after those plans fell through I couldn’t deal with wasting this outfit and went to the grocery store. I felt so good in it. Usually I’d have no problem getting back into my pajamas for an evening in, but this outfit made me feel gorgeous–which is truly a feeling I’ve worked a long time to achieve! Most items I’ve owned with sequins scratch my arms and make the tops very heavy and take away any stretch. With my hips a good size or two bigger than my upper body, I NEED stretch in my tops, and luckily the Penningtons’ top had plenty of it. Also, the sequins were really small so the edges didn’t itch like other tops had before. I put on more sparkles with my earrings for this look, but I can easily see many of my accessories working with this top. 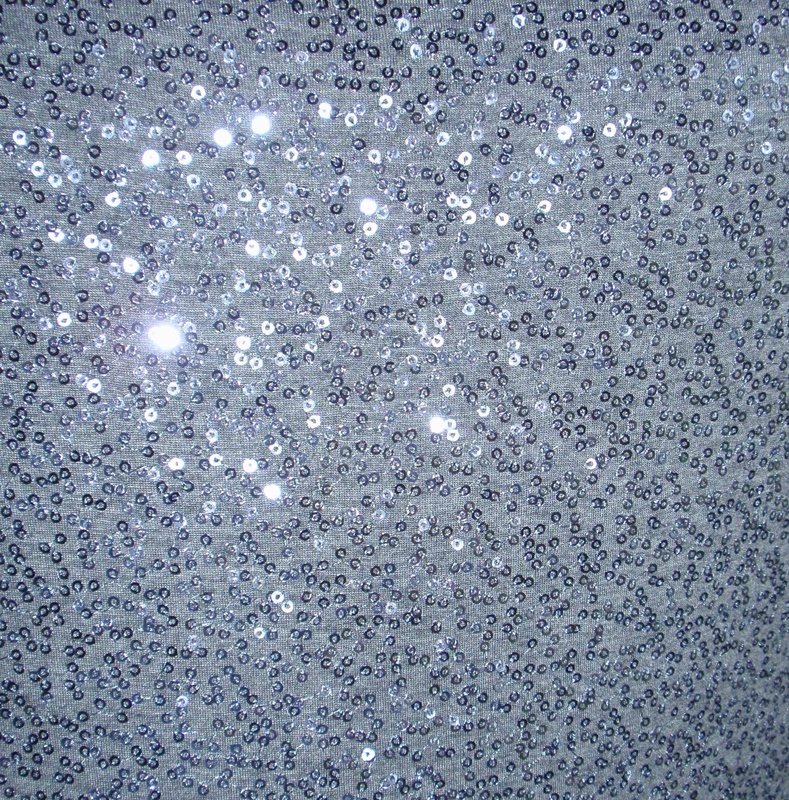 Top PROS: The sequins were REALLY shiny and sparkly and added that glitz you want in a sequin top, and they weren’t itchy! I liked that the top was stretchy. I would consider getting this top again in a size up so that it would be more drapey. (It runs sizes X-5X or 14/16 – 30/32.) The length was perfect for me, and I liked the neckline. I also think the price, $39.99, is reasonable in comparison to other sequin tops I’ve seen out ther. Top CONS: I’m not a fan of short sleeves, which is more my aesthetic than a con of the top. I’d love to get it again with a 3/4 sleeve and a boatneck, but it is what it is! When I was talking on Twitter about receiving this top, my blogger friend Moe from Five Favorite Things said she had also received the top. 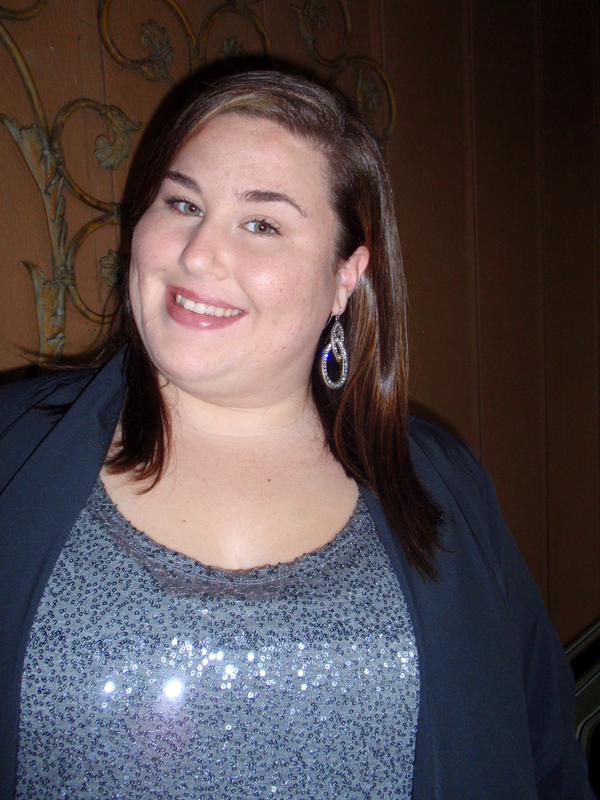 Moe’s blog is a plus size shopping blog where she shares her favorite things (plus size related of course), mostly clothing as well as some product reviews. She sent me a picture of how she styled the top, and I love how she made it work for casual days out with the denim jacket. So what do you all think of the top? Have you shopped at Penningtons before? They now ship to the US! *Top was gifted to me by Penningtons. The above review is my true and honest opinion. Thank you to Penningtons to the wonderful addition to my wardrobe! Now that you mention it, I would love it even more if it were 3/4 sleeve. It’s great to see a promotional gig for a plus size store that isn’t all about “dressing for your shape” or flattering/minimising or even worse “real women”. It’s fun and silly and positive. I have a sleeveless top almost the same as that sequin one too, I wear it to work! Oh, I love how you styled it! 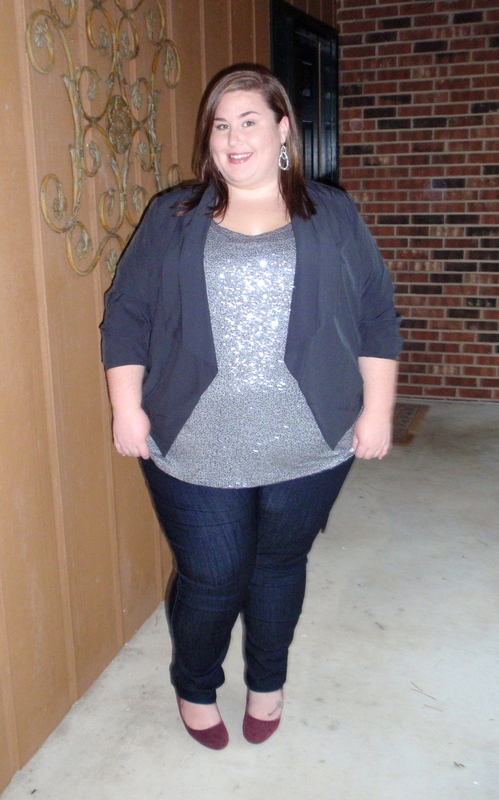 I love a good sequined top and that one looks great. I also find a lot of sequined tops can be itchy/scratchy, so it’s good that this one isn’t. You look fab! I really like that top and I’m usually not a fan of sequins. It looks like somewhere I would like to shop! Not too sure about the firemen in the mirrors though. It made me giggle and cringe at the same time.